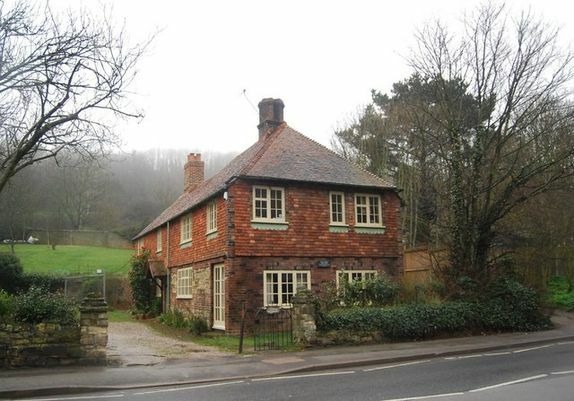 For twenty years before moving to Nottingham, I lived in Hastings in East Sussex. During that time, I passed this house in Hasting's Old Town on many occasions. There's an old wooden plaque on the wall which says, "Titus Oates lived here. 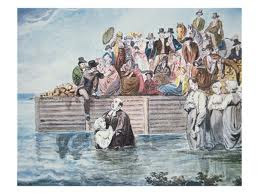 Baptised in All Saints Church 1649". However, Titus Oates is not a person to be proud of. 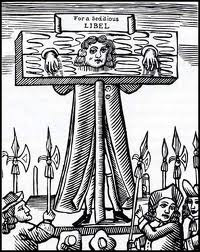 Jane Lane, in her wonderful 1949 book on the life of Titus Oates begins with these words, "The England of 1649 suffered two national tragedies: the execution of Charles 1, and the birth of Titus Oates". In a poll by the BBC History Magazine in 2005, which asked people to nominate their entry for the 'Ten Worst Britains' in history, the name of Titus Oates was nominated by John Adamson of Peterhouse College, Cambridge, who said, "Oates was in a league of his own in the depths of his vileness". So who is this man Oates, and what had he done to bring down such scorn upon his head? To understand Titus, I think that you have to understand something of his Father. Samuel Oates was a man who didn't seem to take religious denominational allegiance very seriously. After leaving Cambridge with a degree, he became a minister in the Established Church. He then became an Anabaptist preacher, and during the civil war of the early 1640's he was a Chaplain in the New Model Army that Parliament had decided to form, which had General Thomas Fairfax as its Commander in Chief, and Oliver Cromwell in charge of the cavalry. Anabaptist means 're-baptiser', and their belief centred on the baptism of believers as adults. Anabaptism (followers were often known as dippers) emerged during the Protestant Reformation, which began around 1517, when Martin Luther famously nailed his 95 theses to the door of Wittenburg Church in Germany. Luther's views on the Church followed those of the 14th Century John Wickliffe and his Lollard followers, but were much more developed and successful. Anabaptists believed that all institutions were by their nature corrupt, and this gave them the right to disobey laws imposed by governments. Because of these views, they were seen as a threat, and suffered great persecution in many parts of Europe. Puritan records from the 17th Century give some damning reports of Samuel Oates as an Anabaptist preacher. "He roamed the county of Essex, taking advantage of young women, who would sneak out of their houses at night to be 'dipped' in the nearest river or pond, naked". There are several accounts that say some of these women were made pregnant by Samuel Oates. He would charge a fee to these women; the rich would pay more than the poor, but all would pay. By 1660, Samuel was back in the Established Church, and from then to 1674 he was Rector of All Saints Church in Hastings. This flirtation with denomination life for his own gain was passed on to his son. Samuel had little affection for his son, who by all accounts was not an attractive child, or a clever one. Was Titus' subsequent life a result of nurture or nature? Whatever the answer, his life was a catalogue of lies and expulsions. Titus was born on the 15th September 1649 in Oakham, Rutland. His school life was a catastrophe. He attended Merchant Taylors School in London, but was expelled in 1665, and went to a school in Sedlescombe, near Hastings, with no better result. Somehow he managed to get into Caius College, Cambridge, and later St John's, but was 'sent down' without a degree because of dishonestly trying to get a coat, among other things. Not having a degree was no problem to him, as he just pretended that he had one. Miraculously, for one so consistently described as a dunce, and with a reputation for dishonesty "he slipped into holy orders", and became Minister of an Established Church in Bobbing, Kent in 1673. He was expelled from this living for dishonesty, and went to act as Curate to his Father in All Saints Church, Hastings in 1674. Titus really wanted the position of school master in Hastings, which was held by one, William Parker. Titus and Samuel brought a trumped up charge of buggery against William Parker to get him ejected from the school. The charge was so evidently false that Samuel was ejected from his living in the Church, and Titus was charged with perjury, and sent to prison in Dover to await trial. From there he escaped and went to London, and gained appointment as Chaplain on board a king's ship. This lasted twelve months before he was expelled from the Navy for being caught committing buggery with a sailor. This was a capital offence at the time, but he escaped death because he was a "man of the cloth". Titus may have been a dunce to all of his tutors, but he had a remarkable way of getting jobs, even if he kept getting expelled from them. After the Navy, Titus bluffed his way into becoming Chaplain to the Earl of Norwich. He was expelled from this after a few months for being "generally unsuitable and constantly inebriated". After this latest expulsion, he converted to Catholicism, because he hoped the Catholics might feed and clothe him. He was accepted into the Catholic Church in March 1677. Later, he met Father Richard Strange, head of the English Jesuits, and many believe that they became lovers. Father Strange arranged for Titus to study with the Jesuits at Valladolid in Spain under the pseudonym Titus Ambrosius. Guess what? He was expelled when they realised that he had no grasp whatsoever of Latin. Strange helped him enroll in another Jesuit seminary in France under another false name: Samson Lucy. One writer describes his stay like this. "here, his engaging personal habits - drinking, smoking, swearing and lying - made him so unpopular that a fellow seminarian attacked him with a frying pan". He was expelled, and returned to London. His attraction with Catholicism was over. Now all he wanted was revenge on the Roman Church that had so snubbed him, and the Jesuits in particular. It may have taken a long time for me to get here, but we're at the point of Titus' story that has made him so reviled - the Popish Plot. Titus met up with an elderly friend of his Father's, Israel Tonge, who hated Jesuits with a passion. Together in 1678, the two men wrote a lengthy manuscript accusing the Roman Catholic Church of plotting to kill King Charles 11, and replace him with his Roman Catholic brother, James. They claimed that when that happened, Protestants would be massacred in their thousands. This caused public panic, and made Catholics even more unpopular than they already were. Titus was interrogated by the King's Council, during which he made 43 allegations against various members of the Catholic orders, including 541 Jesuits; this later grew to 81 allegations. He also made allegations against people in high positions, such as the Queen's physician; secretary to the Duchess of York; the Archbishop of Dublin; Samuel Pepys and a few months later he accused the Queen of working with the King's physician to poison him. Though reaction to the allegations was far from plain sailing, Oates was given a squad of soldiers and he began to round up Jesuits. All told, around 80 were arrested, and accused of taking part in the plot. In all, about 15 were executed (some say 35), including the last high profile victim, Oliver Plunkett, Archbishop of Armagh, who was executed on the 1st July 1681. 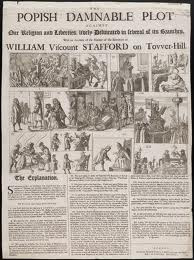 The tide was now turning against Oates, and people were beginning to realise that the 'Popish Plot' was nothing but a bunch of lies, that brought public panic, and the death of innocent men. When the Catholic James 11 became King in 1685, he had Titus Oates tried before Judge Jeffreys, who described him as a "shame to mankind", and was found guilty of perjury. The punishment was extreme and brutal. He was to be pilloried, whipped and imprisoned for life. James also stated that once a year, Oates was to be brought out of prison, pilloried and severely whipped, and sent back to prison. This lasted for three years, before James was replaced by the protestant William of Orange in 1688, who pardoned Oates, and granted him a pension of £5 a week. The treatment of Oates eventually brought a change in the law, which dealt with brutal and inhumane treatment of prisoners. After being freed from prison, Oates became a spy for the King, got married and somehow became a Baptist minister. He was again disliked, so much so that one member of his congregation barred him from attending her funeral. On the day, Oates' response was to occupy the pulpit and preach a long, irrelevant sermon which caused a riot in the Church. He was yet again thrown out of his job by his own congregation. His last appearance in court was in 1702 when he was fined at Westminster for hitting a woman over the head with his walking stick. "He spent his last years in obscurity writing religious tracts that nobody read and haunting the Westminster law courts as a spectator". 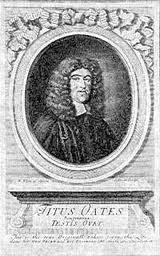 Titus Oates died in 1705. Very few would disagree with John Adamson, that "Oates was in a league of his own in the depths of his vileness". Another historian gave this damning verdict, which none of us would like to be said of ourselves. "If Titus Oates had any redeeming features, history does not record them". I'd like to think that there are many lessons to be learnt from the failings of this man. Fascinating! I'm trying to track down an OATES who was connected with the family of one Thomas SHARP who left a will in 1709 in Dublin, and I ran across your blog in my search. Thanks for making all this history so easily available. Thank you for this post. For a dunce he sure slipped out of many complicated circumstances. My last name is Oates and I must say Titus was certainly in a league of his own. Nice article. I used to see that plaque as a kid (my family lived in The Royal Standard) and wonder who he was. I now know who William Parker was as well.